Heroes In My Closet: Which cartoon character would you choose? In Tokyo, this (life-size?) 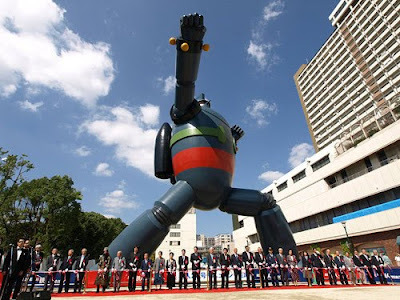 statue of the vintage Japanese cartoon character, Gigantor, was recently unveiled. It stands 60-feet tall, weighs a whopping 50 tons and cost an estimated 1.5 million dollars to construct (I hear they found the builders on Angie's List)! As a childhood fan of the cartoon series—which premiered in the U.S. in 1966, but debuted in Japan in 1957—and lover of giant monsters, robots... pretty much anything, I think this is awesome! 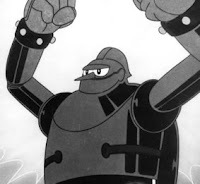 I barely recollect the cartoon—I was only 3-years-old—having stronger memories of the theme song (Gigantor the space-age robot/He's at your command...), but I always loved the character. I actually have a 10-inch toy of Gigantor—the arms and legs bend, and the eyes light up!—complete with a 3-inch version of Jimmie Sparks, the 12-year-old that controlled the robot in the cartoons. What beloved cartoon character would you have constructed and where would you put it (Be nice!)? Would you have Bugs Bunny, clad in the baseball uniform he wore when he took on the Gashouse Gorillas, catching a fly ball atop the torch of the Statue of Liberty as he did in the cartoon? Or maybe Kimba, the White Lion standing on Siegfried and Roy's lawn. Let's see how creative you can be. Did you know about the full-sized Gundam completed earlier this year? Well, I have several Dallas Cowboy statues made by Todd Macfarlane! Now that I think of it, I have Superman, Batman, and Cutter from Elfquest too. 'Nuff said. I'm a geek I guess. Son, I said, Son, I would build a huge sculpture of Foghorn Leghorn on George W. Bush's Crawford Ranch, cuz he's a chicken. I said, he's a chicken and as sharp as a bowling ball. I want a Veritech fighter that looks like it just crashed, partially embedded in the ground, in the middle of a bustling downtown area somewhere like Times Square. Or something bursting through the street from below like the scene on Fantastic Four #1, completed with statues of Mr. Fantastic, The Thing, Human Torch and Invisible Girl. Okay, I got it. I want a statue of Spiderman as he is swinging through New York, carrying Stan Lee with him for the ride. And from Stans mouth comes the words, "Vroom!" But I think a Spider-man statue in New York should absolutely become a reality. After all, he is synonymous with the Big Apple and a world pop culture Icon. There's a Superman statue in Metropolis, Ohio (I think, that's where it is) and there isn't a real connection there. Better yet, place the Spidey statue on the side of the old New York Times Building in Times Square with a statue of J. Jonah Jameson sticking his head out of a nearby window and screaming at the Wall-Crawler. There you go! And maybe have Doc-Ock waiting on the edge of the roof with tenticle arms and everything.